Bonsai as an art form has impressed many accross the globe. I happen to be one soul mesmerized by the shear beauty of this craft. This website is my impression of this beautiful hobby. You will find most of your questions answered through the informative articles on this site. Be it shaping a new sapling or concern about the pests that have taken control of your plant, you will always find listening ears here. Our exhaustive database of information on various species will guide you through the dos and don'ts of any particular tree family that you may be interested in. 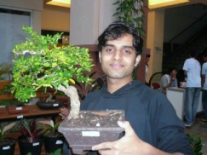 Be it searching for the right bonsai tool or looking for caring techniques, this site will help you for free, because I pride myself being an enthussiast of this exotic art. This site is far from being a one way journal where you read whatever is served. The mission of this site is to involve as many enthussiasts as possible and become a part of their daily life. Please make this a joint where you drop down to discuss anything and everything related to these miniature plants over an e-coffee. Together we can make this the destination online for enthussiasts world wide. By the way the guy in the above photograph holding that beautiful miniature is me - Narasingh. Yeah you got it right! I am your host and together you and me are going to explore this beautiful world of miniature plants. Check back soon and take care.